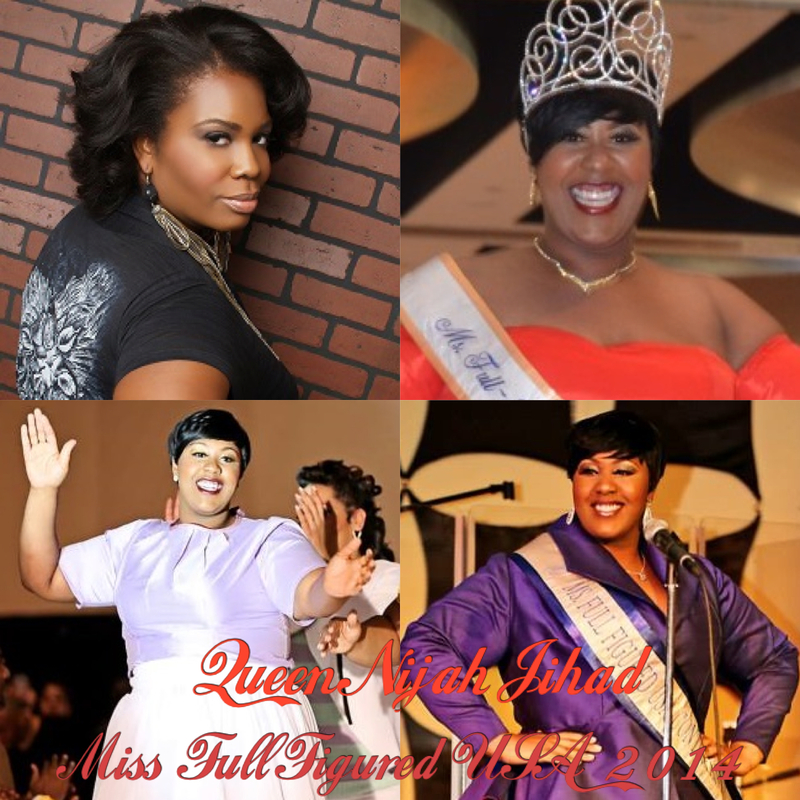 On April 12, 2014 Theresa Randolph’s JT Pageant Production’s Miss Full Figured USA Pageant has crowned a new queen and that Queen is Ms. Nijah Jihad! I have the advantage of sharing with you an exclusive interview with the Queen herself. I’ve known Nijah since the 5th grade and am excited about her journey. Certainly she’s come a long way and I’m sure there is a lot more to come. I’ll also be interviewing Queen Nijah on my new radio show, Indeed w/Rhenotha Whitaker on http://www.ibn4u.com, Wednesday’s at 10:00am so Tune In and away we go. When did your journey with pageantry and modeling begin? It was always something that I wanted to do but it was in the back of my mind. My actual pageantry journey began the day I auditioned, November 2, 2013. I also auditioned for FFFW Week in March of 2013. I was not one of the girls chosen but the fact that I went through with the process made me a little bit stronger. It helped to build my confidence. I was relentless and knew that one day my time would come…and here we are today!!!!! Did you grow up with self esteem? No. It was talked about in my household but I didn’t feel it, which is why I am so passionate about reaching other young women. I can identify with people who feel less than or not good enough. It’s really hard to put in words but if my personal testimony can help shed light on another woman’s struggle, then I will keep sharing it. Why did you enter into the pageant? I entered the pageant because I believe dthat I could. It was something that drew me in, so I took a leap of faith. I could not allow any negative thoughts enter my mind. For so long, I held back, but this time, I had to lock down all of the external conversations and chatter, and I decided that I wouldn’t let anything stand in my way! What do you want to accomplish as Queen? There are so many things that I want to do. This is just the beginning but overall, I just want to inspire women everywhere I go. What does being full figured mean? Being full figured is not just about my physical size. It’s about my mind set as well – being full with beautiful thoughts, embracing the fullness of life and truly loving the skin I am in and not allowing society to dictate my destiny based on society’s norms! Describe your weight loss journey? I don’t diet, I learned how to eat for life. I made small adjustments to what and how I eat and also incorporated exercise 5-6 days a week and drink plenty of water. What are your weight goals? For health reasons, my weight goal is to be under 200lbs, between 190-195. So you are queen, now what, What’s in store for Queen Nijah Jihad? Queen Nijah’s garments were hand created by Designer/Runway Coach Extraordinaire The House of Thomas LaVone by Thomas LaVone Woodard. He is an amazing designer and has designed for Miss Full Figured USA 2012 and 2014. It is safe to say that if you get your garments from him you just might be queen! Thank You for reading Full Figured Fabulous and on the Way to Fit by Rhenotha Whitaker. Don’t forget to tune in to my new Radio Show Indeed w/Rhenotha Whitaker on http://www.ibn4u.com. ← Being Mary Jane: What Extraordinary Looks Like?